The Only Instant Pot Gift Guide You Need! 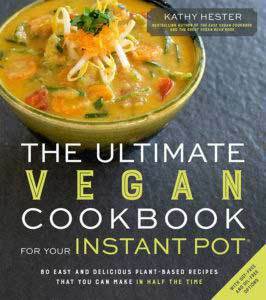 Online Class 2: Start Cooking In Your Instant Pot – More Recipes! I love a thick hearty chili and I bet you do too. 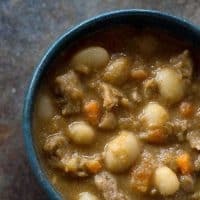 My Instant Pot caballero bean and soy curl chili is different from the traditional version and is closer to a vegan white chili. 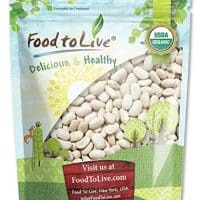 If you can’t get a hold of the seasonal heirloom caballero beans, use any dry white bean that you have in your pantry. I got mine in a past box of Rancho Gordo’s bean club. Get on the waiting list if you can, it’s fun to get cool heirloom beans 4 times a year. Caballero beans are a fancy heirloom varietal that you can get some times at Rancho Gordo. It’s a big fleshy bean that’s super creamy. I like using heirloom beans because the textures and flavors are really amazing. They do cost more, but you can always use less inexpensive beans in their place. What Beans Could I Use Instead? Any white bean will work well, as long as you soak them before hand. 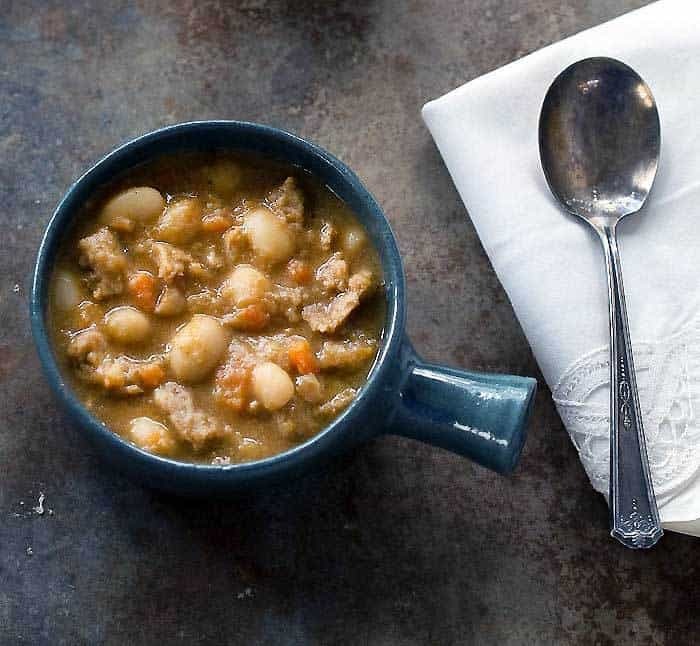 My least favorite for this recipe would be navy beans but they will work too. Try cannellini beans first. I like them because they are larger and have a nice bite. Honestly, you could use kidney beans in a pinch! 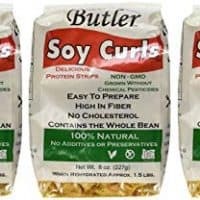 Soy curls are non-gmo soybeans that are cooked, smashed, then dried. 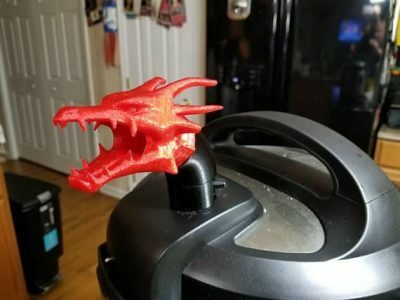 They are not all over the country, so many of you will have to order them on Amazon like I do. If you live in the pacific northwest, you may find them, because the company is based there. You can make this with any white bean. I've made it with cannellini beans and in the photos, I used Rancho Gordo's Caballero Beans. The only difference is you made need to cook an extra 5 minutes if you're using old beans, because those take longer to cook. Use the sauté setting over normal, or medium heat, and heat the oil or water. Saute the onion until they become transparent. Then add the garlic, cumin, chili powder, and carrot. Sauté a minute more. Puree the diced tomatoes and green chilies together in your blender. Allow the pressure to release naturally. Stir in the blended mixtures, nutritional yeast, oregano, salt, and pepper, then serve. Nutrition information is provided from nutritionix.com as a close estimate. 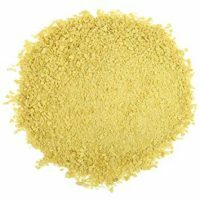 If you have specific health issues please put the recipe information into the nutritional calculator your Dr. recommends. Take one of my Teachable Instant Pot video classes! 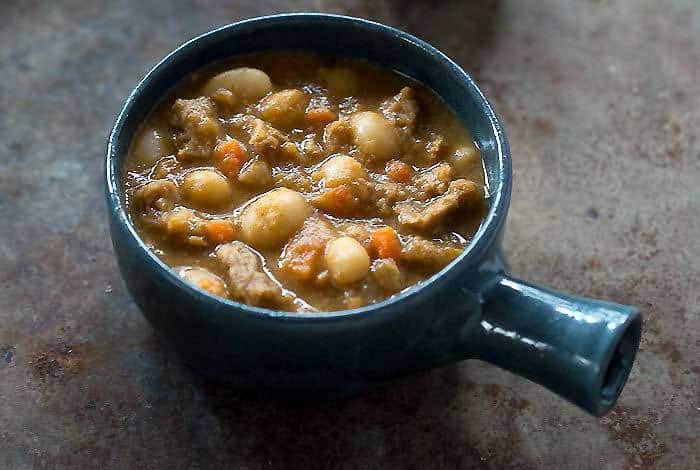 Can you use canned beans; and if yes, do you put them in for 15 minutes as with the soaked beans? Or..is there some other method. You can use canned beans, but you’ll need to either use less water or turn the IP to saute before serving and cook off the extra water. A bean club sounds like a fun idea…I’ll have to check that out. I love that you use more exotic takes on some pretty common ingredients. Are the caballero beans like butter beans at all? OMGoodness this looks so so good! Thanks for sharing! I need to find those soy curls. This recipe is intriguing! I’m so ready for chili season. Love that you can use the Instant Pot for this dish. I grew up eating white bean chili similar to this. I’m intrigued by the soy curls! I also don’t think I’ve ever tried caballero beans, I’ll have to add them to my list. Okay, you\’ve intrigued me. 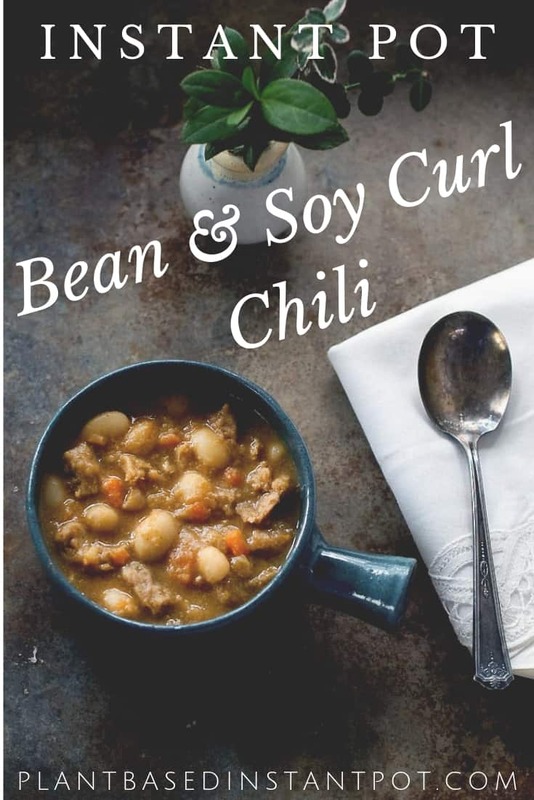 I have never used soy curls! I remember hearing about them way back when, but they fell off my radar. What is the texture like? The texture is chicken-like and it absorbs flavors great too! it is chili season for sure! I love the sound of this one, and definitely love those Rancho Gordo beans. My son is currently obsessed with all things bean so I know he’ll love this recipe! I definitely need to start using my instant pot more. I think this fall season will be all about soup and chili! I can’t wait to experiment with this recipe. Oooh, Kathy Hester, this sounds so good! I shall show The Beloved!